Before I get into to our travel (mis)adventures to Spain, I have to take a second to wish my beautiful little sister Bethany a Happy Birthday! I’m fortunate that we’ve always been close, and the older we get, the closer we’ve gotten! Wow…my husband, mom, and sister all having birthdays within 6 days of each other – an expensive week for me! But so fun to have celebrations to look forward to. So… What happens when you miss your bus to Spain? AJ and I felt really rushed trying to catch our train from Paris to Bordeaux, so we wanted to leave extra time getting to the bus just in case we got lost or ran into any delays along the way. We made our way to the bus stop with about 20 minutes to spare, and feeling good about it. As the clock is ticking down to 2:00pm we start looking around and wondering, where is everyone else? Surely others in Southwest France are traveling to Spain? This is weird. It’s now 1:50pm and AJ and I are reviewing our tickets for the millionth time, double checking the date, time and pick-up location. Everything looked right, until it dawned on us at the exact same moment. We’re in Europe. Europe uses the 24-hour clock. So…our 2:00 ticket is not for 2:00 in the afternoon, but for 2:00 that morning! We missed our bus! At this point, we’re not sure what to do. 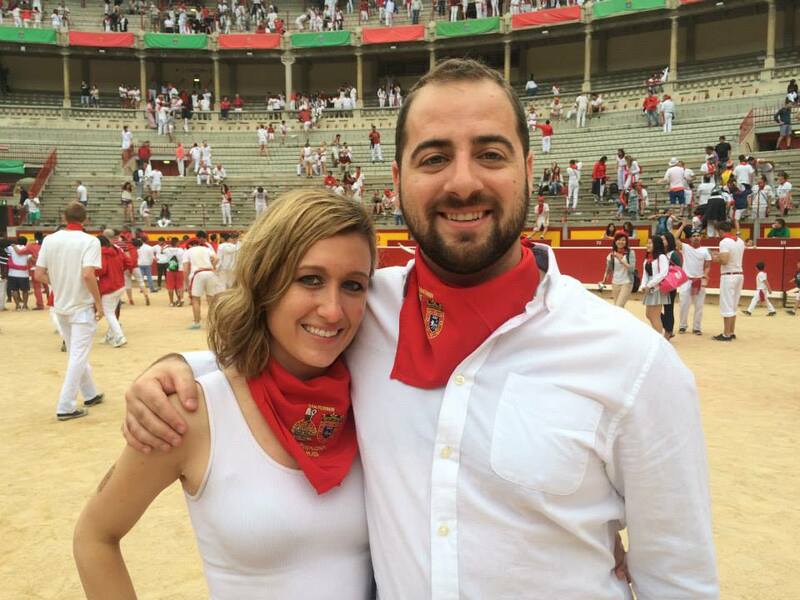 We had to be in Pamplona by 6:00am the next morning for the Running of the Bulls. Even if we threw in the towel on that, we still needed to get there because we had a flight from Pamplona to Milan that afternoon. Between spotty train station wi-fi on our phones and a trip to the ticket desk, we (mostly AJ) figured out a solution. We would take the next train to Irún – a Spanish town just over the French-Spanish border. Travel intra-country is obviously much easier, so we’ll be able to then take another local train from Irún to Pamplona. Whew! We’re feeling much better. We arrive in Irún…and now I start getting a little nervous again. We’re in the middle of no-where Northern Spain, the train station is basically deserted, except for 1 ticket window and we find out there are no trains to Pamplona. Also, there’s no wi-fi. I had visions of us trying to sleep on the train station benches, and it wasn’t pretty. We discovered a train to San Sebastian and decided to hop on it. We didn’t know what to expect there, but we figured it couldn’t be worse than where we actually were. We arrived and then made our way to the bus depot, where we hoped to take a bus that night to Pamplona, about 2 hours away. We stood in a long line of drunken teenagers and thankfully got 2 of the last bus tickets for that night!! We started to relax again and tried to enjoy a little bit of San Sebastian and dinner before our 9:30pm bus. The bus ride was uneventful and we arrived in Pamplona around 11:00pm and realized we were lost once again. Since our transportation here was so piece-meal we really didn’t have much of a plan, other than asking people for directions. We started walking around the city with all our luggage. We tried hailing a cab, but apparently that doesn’t work, you have to call the cab company and we had no way of doing so! Finally we found a Chinese restaurant with free wi-fi and AJ was able to look up the route to our hotel and take a screenshot. These were our only directions. We’re now getting into the heart of the crowd, and let me tell you, this was the craziest festival, party, whatever I’ve ever seen. It’s now almost midnight and the streets are PACKED with party people. Here’s where I had a mini-breakdown. We knew we were close to our hotel, but couldn’t quite find it. I’m trying to get through the throngs of people with my wheely suitcase, literally I’m wheeling over other people’s toes. I’m tired, cold, so thirsty, and I keep getting beer spilled on me. I knew I couldn’t totally break down, that wasn’t going to help anything, but I was close! Finally, like a beacon of light, we saw it – Hotel Maisonnave! We checked in and AJ went out to grab some bottled waters while I took a long hot shower, that was the best feeling ever! We then had to quickly get to bed before our 5am wake up, so it was more like get to nap. Because we were not running, AJ did his research and reserved 2 spots on an apartment balcony on Calle Mercaderes, near “Dead Man’s Curve“. This was a great idea, no way would I want to watch this on the street, not only was it really dirty, but my 5’1” self wouldn’t have been able to see anything! The Encierro, or the actual running of the bulls, is very quick – like 2 minutes. Canons shoot off and the bulls are released and run alongside the participants. Oh, and anyone can run. It’s not like you have to sign up or sign a release form or anything like that. You could literally be standing on the side and hop in or out at any time. Craziness! After the final canon sounded, that meant all the bulls were accounted for in the bullring. We all made our way there for a “show”, I’m not sure what else to call it. It wasn’t a bullfight (that’s at night), but they would release one bull at a time into the arena with the runners and it would chase and flip them for a couple minutes. Kind of strange, and I started to feel bad for the bulls, obviously they just had no idea what was going on. I asked the woman who we rented the balcony from what happens to the bulls, and she said each night they are killed. I kind of knew this, but sad! She did say, however, that the meat was donated to the elderly and homeless shelters. After the bulls were put away, the spectators were allowed down into the bullring. Oh, you’re admiring our snazzy outfits, are you? For the Fiesta of San Fermin, it’s customary to wear all white with red scarfs, and you can’t see it but AJ also has a long red sash around his waist. All this happened before 9am, so immediately following this picture, AJ and I went back to the hotel to relax and we both ended up falling asleep! We slept for an hour or so and then decided to take advantage of the festival. We got some drinks and food and walked around. After awhile we just had enough. I was ready for Italy. We decided to just get to the airport early and hang out before our flight. (This airport by the way, had about 2 gates.) I read a little and AJ and I took turns taking cat naps – we were still so beat! Finally we boarded our plane to Madrid where we had a short layover, and then we were on our way to Milan, Italy for week 2 of honeymoon adventures!